Lifecountz strives to set benchmarks in quantification of various dimensions of wellness by adding 'predictive' to the contemporary preventive- promotive model. We are committed to offer medico driven, personalized recommendations to both Individuals and Corporates to elevate their health and in turn positively impact their bottom line. Lifecountz has an inherent belief that a ´healthy mind and body´ brings ´skill in action´. All our actions are driven to create a society performing at its optimum best! Believing in the adage Health & empowerment alters life, Lifecountz targets personalised behaviour modification programmes targeting adoption of health lifestyles by individual as well as Corporates. Get your mundane queries answered by doctors from your laptop, tab or smart-phone. Practice healthy eating through knowledge and skills of making healthy food choices. 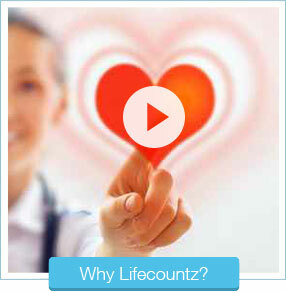 Quality assured, exclusive Lifecountz medical panel. Empowering to enhance & sustain the productivity of the available resource pool. From a Corporate standpoint, I have known Dr Asrani, for more than a decade beginning with Hapag-Lloyd to the present and I can easily recall huge contribution from Dr Asrani towards the areas mentioned above. I am confident Dr Asrani will be hugely successful in converting his vision and passion in Wellness and Healthcare into "moments of truth" for masses and set new benchmarks in the industry with his Lifecountz. The HRA report of Lifecountz was a revelation. We feel we know everything about what we do (or don’t) but the way my actions (and inactions) were objectively measured and the road map was presented for improvement was unbelievable. The lucid language and subtle cajoling has motivated me to follow the recommendations. Truly a world class product! Dr Asrani is here again with yet another wonderful product that will not only help us reflect on the current state of individual health but also suggest clear recommendations with a road map on things that needs to be done for better well-being. Way to go, Dr Asrani and Lifecountz! !